Hacienda de los Santos is the detailed result of decades of renovations made to an authentic hacienda, with five Colonial-style mansions, and one 17th century sugar mill property located within the quaint National Landmark Mexican village of Alamos. Family owned and operated, the Hacienda boasts an attentive level of service and thoughtful details throughout the historic property. Travelers can discern among the ideal accommodations of guestrooms, suites, and villas, 34 in total, for their comfort and enjoyment, each promising matchless views of the landscape surrounding them. With the hotel's Dulce Vida Spa, four luxurious swimming pools, and an array of dining offerings in the two hotel restaurants, travelers can delight in the plethora of activities available onsite without ever departing hotel grounds. When exploration calls, guests can enjoy endless opportunities, from historical sites, to outdoor adventures, and more throughout the Mexican countryside. At Hacienda de los Santos, visitors are invited into a world of matchless luxury, offering them a charming respite during their time in Mexico. The AAA Four Diamond (for 20 consecutive years) Hacienda de los Santos was honored by U.S. News & World Report as the "#1 in Best Northern Mexico Hotels." And by TripAdvisor® as "2018 Travelers’ Choice," “Certificate of Excellence,” "Top 25 Luxury Hotels in Mexico,” “Top 25 Hotels in Service in Mexico,” and the "#1 Hotel in Alamos." 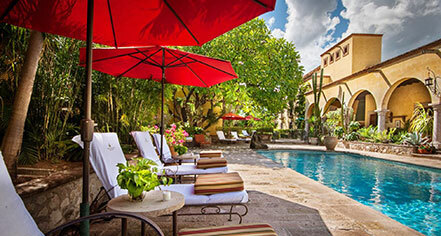 Hacienda de los Santos, a member of Historic Hotels Worldwide since 2015, dates back to the 1600s. Hacienda de los Santos has history rich with Spanish Conquistadors, mining barons, imperialists and revolutionaries, all of who have left their mark. Airport Transportation: Local airport pickup (XALA) may be arranged through the hotel's concierge; complimentary. Parking: Secure off-street parking is available. Pet Policy: Pets allowed with restrictions. Hacienda de los Santos is the detailed result of decades of renovations made to an authentic hacienda, with five Colonial-style mansions, and one 17th century sugar mill property located within the quaint National Landmark Mexican village of Alamos. 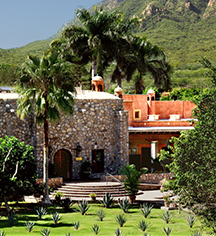 Learn more about the History of Hacienda de los Santos .